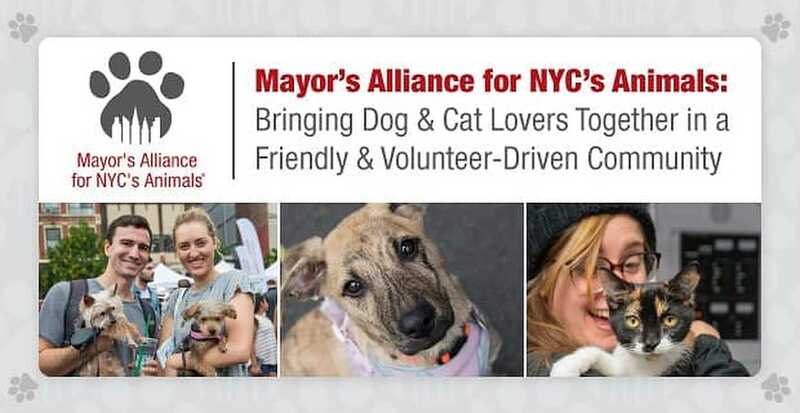 The Short Version: If you’re a New Yorker looking for someone to cuddle, you might want to check out the events held by the Mayor’s Alliance for NYC’s Animals. This longstanding nonprofit organization gives animal lovers the opportunities to save the lives of homeless dogs and cats throughout the city — and meet plenty of viable date prospects while they’re at it. You can adopt or foster a furry friend to keep you company and act as your wingman at dog parks or animal-related events. The Mayor’s Alliance for NYC’s Animals hosts frequent adoption events, fundraisers, and training workshops which can help pet owners network with one another. You can take advantage of these charitable events to up your social game and find a fetching companion in your neighborhood. Most Saturday afternoons you’ll find me at the dog park chatting with fellow dog owners and watching our pups chase each other and then roll around in the dirt. Ever since I rescued my 2-year-old Labrador mix, I’ve had a reason to wake up early-ish on the weekends and spend the day under the sun rather than on my couch. My dog’s never-ending need to play and run and jump and sniff has actually been good news for my social life, and I’ve met quite a few good-looking neighbors as a result. One time, a guy actually stopped his bike to introduce himself to us. Like any good wingman, my dog grabs someone’s attention and then lets me seal the deal. I can always count on her to have my back… as long as there isn’t a squirrel nearby. You can meet animal lovers by getting involved with the Mayor’s Alliance for NYC’s Animals. Having a pet can improve your love life by introducing you to a caring network of dog people or cat people and giving you the opportunity to build friendships or romantic relationships based on mutual interests. 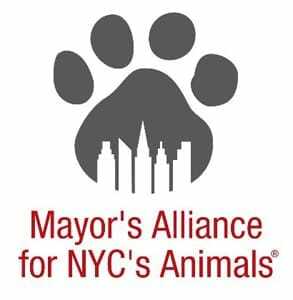 The Mayor’s Alliance for NYC’s Animals unites animal lovers all year round at adoption events, training workshops, and fundraisers. The nonprofit organization has partnered with 150 rescue groups and shelters to transform New York City into a community where no healthy or treatable cats and dogs are killed simply because they do not have homes. Since 2003, the enthusiastic team of staff members and volunteers has worked together to support the efforts of local shelters and rescue groups to save the lives of homeless dogs and cats. To date, the Mayor’s Alliance for NYC’s Animals has saved more than 320,000 lives. One of the many positive side effects of their compassionate work is that countless New Yorkers now find themselves a little less lonely thanks to the furry friend by their sides or on their laps. Volunteering for a cause you believe in can change your life by introducing you to people who become your best friends or life partners. By collaborating with other rescue organizations, the Mayor’s Alliance for NYC’s Animals has made a sizable impact in the quality of life for thousands of homeless pets. The nonprofit has united a community of passionate animal lovers who work hard to facilitate adoptions, microchipping, and low-cost vet services. The Alliance’s Wheels of Hope transport program provides free transportation for animals being transferred from ACC shelters to partner shelters and rescue groups that will find them new homes. The Wheels of Hope is the only one of its kind in the area, and Steve said it’s one of the organization’s most effective programs for saving lives. The Mayor’s Alliance for NYC’s Animals goes the extra mile to assist and support animals in need. You can help out by volunteering your time at an adoption event or purchasing a ticket to a fundraising event. Check out the events calendar to find opportunities to get involved. These events give animal lovers a chance to support a good cause while meeting people who share their passions and interests. The Mayor’s Alliance for NYC’s Animals hosts up to 40 rescue organizations and shelters at its large adoption events in New York City parks. These events encourage animal lovers to take the plunge and make an adorable addition to their families. Each year, hundreds of animals find homes as a result of these mega adoption events. Adoptapalooza, the nonprofit’s signature event held twice a year in Union Square Park in partnership with the Petco Foundation, showcases over 300 dogs, cats, puppies, kittens, and rabbits up for adoption. Professional trainers from Petco are on hand to offer free tips to new pet owners, and free microchipping is offered by Vetco. The Mayor’s Alliance for NYC’s Alliance provides face painting for kids, personalized pet ID tags, and family-friendly activities. A smaller version of Adopapalooza is presented each summer in Brooklyn’s Prospect Park. Beyond the obvious benefit of adopting a new furry family members, the Alliances Adoptapalooza events’ street festival vibes, music, and fun make it an ideal location for local singles to support a good cause and meet fellow animal lovers. For dates and times of this year’s Apotapaloozas and other fun events, visit AnimalAllianceNYC.org. The NYC Feral Cat Initiative provides free training for individuals who want to help stray and feral cats — collectively known as “community cats” — and perform Trap-Neuter-Return (TNR) in New York City. TNR certification workshops empower cat lovers to save the lives of stray cats. 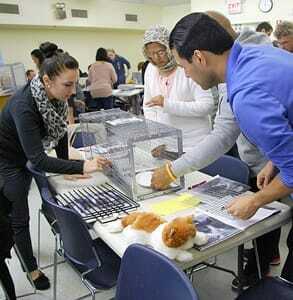 Free TNR certification workshops are offered in all five NYC buroughs. Free specialty training and workshops in bottle-feeding, kitten-taming, shelter-building, and neighborhood relations are also available. These workshops give cat lovers the training and tools to care for NYC’s feral and stray community cats. By completing a TNR certification workshop, you can become certified to help community cats get the care they need to live safely outdoors. From learning how to humanely trap a feral cat to emphasizing the need for spaying and neutering the cats, the workshop is a comprehensive and hands-on guide for participants. Over the years, the workshops have certified over 2,500 New Yorkers to properly care for NYC’s community cats, and the NYC Feral Cat Initiative is currently networking over 8,000 Certified TNR Caregivers. These free and open-to-the-public trainings allow cat enthusiasts to come together to support the well-being of the animals they love. If you’re looking to engage with dedicated cat lovers, you couldn’t find a better place than a Feral Cat Initiative workshop. To register for one of these workshops, visit NYCFeralCat.org. Every summer, the Brooklyn Cyclones invite baseball fans and dog lovers to come together to enjoy a baseball game at MCU Park in Coney Island. They call this event Bark in the Park. You can’t help but have a good time as you crowd into the bleachers alongside a pack of dogs and their owners, and it’s a great way to meet people who share common interests. Tickets generally cost $12 for one person and up to two dogs. In addition to the ball game, fans also can enjoy other fun activities such as a pre-game parade around the field, dog training lessons, and opportunities to adopt a dog or cat or purchase a NYC dog license for your dog. If you want to meet fun-loving folks in New York, grab a leash and a baseball cap and head to MCU Park in Coney Island this summer. Check the Brooklyn Cyclones website for this year’s date. Many dog owners enjoy sharing stories about their dogs, so all it takes to get an animated chat going is bringing up times when your pet did something silly (like chasing birds in the sky) or something horrible (like eating a video game controller). These conversations offer an easy way for strangers to find commonality, exchange tips, and bond with one another. Steve told us that he actually met his partner of 16 years while volunteering as a dog walker at a local shelter on Long Island. They currently live together in New York City. Don’t have a dog? You can use the Mayor’s Alliance for NYC’s Animals’ resources to find out where to adopt your new best friend in NYC. Approximately 30,000 homeless pets are taken in each year in the NYC’s municpal shelters, so you can have your pick of the litter and get someone’s tail wagging in no time. Whether you love big slobbering dogs or sassy purebred cats, your purr-fect match could be waiting for you in the shelter right now. Singles who are afraid of commitment can also foster an animal in need to do their part for the animal community. For a few weeks or a few months, you can provide a temporary home for a pet who needs it and benefit from your foster pet’s cuteness when attracting dates. Who knows? Your furry friend might just win you over too! A good kitty or playful puppy can melt just about anyone’s heart, so that makes them ideal companions for single men and women. My dog has definitely helped my dating game over the past year or so. Not only has she given me a reason to go outside and meet dog lovers around town, but her antics give me plenty of things to say to my crushes once we’ve been introduced. She’s like a high-energy and extroverted friend who is determined to approve of everyone before I talk to them. Plus, she’s always there waiting for me to get home after a date so she can dance with me if it went well or comfort me if it went poorly. People like to say that rescuing a dog is saving a life, but, from my perspective, I was saving two lives by adopting my dog. I was giving myself a best friend and making my days immeasurably better. If you’re single, an animal lover, and ready to meet someone who shares your interests, rescuing or fostering a furry friend is a wonderful way to start a heartwarming love story. You can get involved with the Mayor’s Alliance for NYC’s Animals — either by volunteering or attending an event — to jump-start your dating life and meet tons of New Yorkers who care about the safety and well-being of animals just as much as you do.